As iPic Theaters continue to open across the country, going to the movies may never be the same again. From large plush recliners and blankets to seat-side food and drink service, iPic offers patrons an upscale movie experience. It’s even better than watching a movie at home. The food at iPic Theaters is not your typical movie-fare, not with Chef Sherry Yard at the helm. After 19+ years as Corporate Executive Pastry Chef at Spago, Chef Yard left in February 2013 to bring the historic Helms Bakery back to life. But, as she works on the Helms project, scheduled to open in summer 2015, Chef Yard is also leading the iPic Theaters culinary program. Chef Yard is making a difference in cinema dining by serving elevated food offerings. Serving gourmet dishes in the movie theater? Chef Yard explained, “thirty years ago, no one had thought to put a fine dining restaurant inside a hotel until Chef Bradley Ogden did. The same thing happened when Wolfgang Puck first opened a restaurant in Las Vegas. No one had done it before. We have watched food evolve.” Now it’s time for food to evolve at the movies. We all know that the concept of dinner and a movie sounds easier than the reality. With evening movie start times falling at the same time as dinner, we have all found ourselves trying to fit it all in. We rush through an early meal in order to make it to the movie on time. Or you eat the movie popcorn for dinner or leave a movie starving and have a later meal than normal. Or perhaps you have brought your to-go meal with you into the theater and tried to quietly open the plastic bag and not spill the food all over your lap. 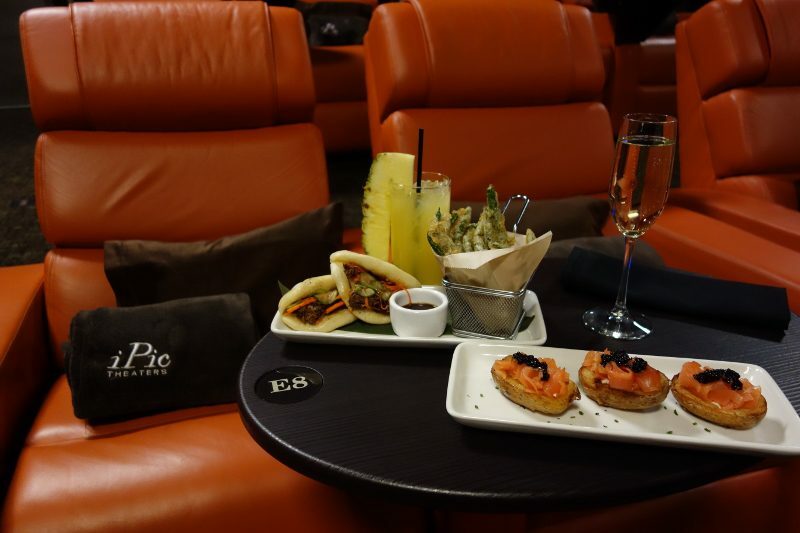 At iPic Theaters, you can eat, drink and watch a movie……basically dinner IN a movie, all in style. There are two options at the iPic Theaters. With the purchase of a Premium Plus seating ticket, you will have in-theater service. There is a tablet that slides out of the tables with a complete menu. The tablet has low-light so as to not distract other patrons. A server will stealthily come to your seat to take your orders, serve and clear your food and drinks. With the purchase of a Premium seating ticket, you can order many of the same items at the concession stand and will have a tray connected to your seat, but you will not have a server to wait on you. The idea behind the food is that Chef Yard has created a menu of dishes you might want to eat if you were dining out. She has created a diverse menu with 27 selections. She works with farmers and produce companies to create a menu that represents the cities where iPic theaters are located. And, Chef Yard has made sure that none of the food is too loud or too smelly so as to disturb other guests. Best of all, Chef Yard has created a menu that you can eat with your hands in the dark. No forks and knives required. The menu consists of elevated gastro pub bar food with ingredients coming from the local Farmer’s Markets. Hot Nosh Bites & Starters include tempura green beans with Szechuan salt, potato knishes with black truffle mustard, spicy salmon tartare, braised pork belly empanadas, Caesar spears and potato boats with smoked salmon, crème fraiche and ostera caviar. If you can make it past the list of tasty starters, the Sammies & Supper list includes homemade bao buns with shortribs, lobster roll, mahi mahi fish tacos, Rueben sandwich, roast beef French dip, pizzas and more. For something lighter, the Spreads, Dips & Petit Feasts, include a cheese plate, a Farmers market crudité with dips and charcuterie. And, if you love nachos, the Naan-Chos are a must. Instead of greasy, salty chips with cheese spread, Chef Yard has grilled naan bread and topped with sweet pea guacamole and roasted red pepper hummus with smoked gouda. With a continually evolving menu, Chef Yard aspires to offer a lot of options and wants guests to have fun. There are currently eight iPic theaters around the country with a 9th about to open in Bethesda, Maryland with an anticipated 3-4 new locations per year. Chef Yard is working fast and furious to create new seasonal dishes. During the summer, she offered ice cream pops and recently added two new cakes to the menu – sticky toffee candy cake and chocolate s’mores cake with toasted marshmallow and graham crackers. We hear all the time that movie attendance continues to decline across the nation. But iPic Theaters may change that. Dinner and a movie will never be the same. Traditionally, La Paulée is a Burgundian celebration held at the end of the grape harvest. So, hosting “La Paulée”, which comes from the French word for sauté pan, poile, during the Santa Barbara Celebration of Harvest Festival, was fitting…..and lots of fun. 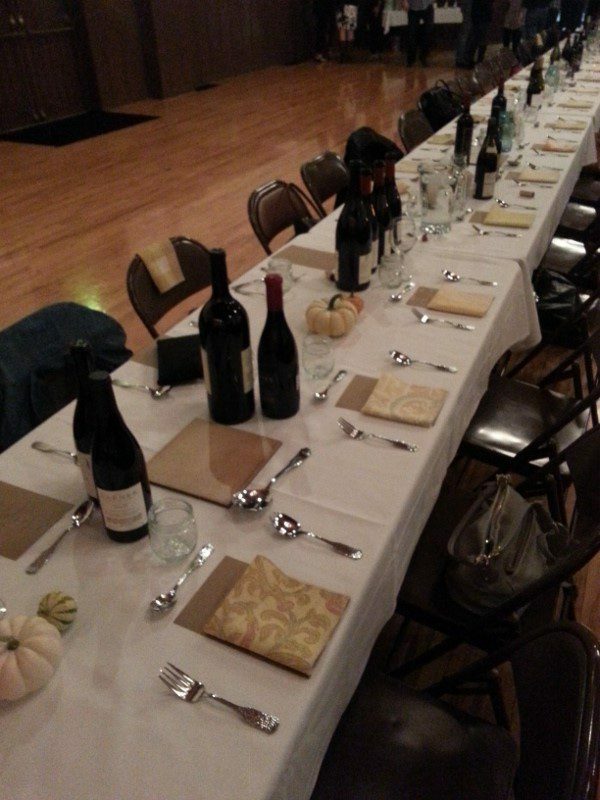 To kick off the Celebration of Harvest weekend, La Paulée was hosted on Friday night. In addition to a ticket to the event, the only other requirement is to bring a bottle of wine with you. This BYO event does not mean that you grab the first bottle you find or run to the supermarket on your way. What you want to do is look into your collection of wines and bring something that you are proud to share.